The with spiraling costs of fossil fuel and adverse environmental impact of convectional power generation becoming a major challenge, the Defence Research and Development Organisation (DRDO) is exploring the feasibility of exploiting wind energy to produce electricity in remote high-altitude areas. 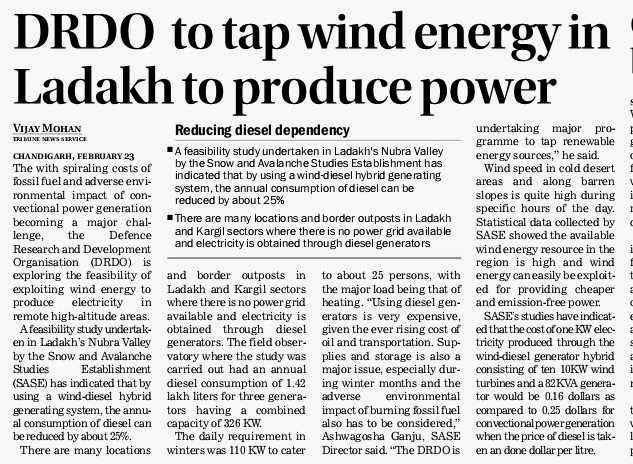 A feasibility study undertaken in Ladakh’s Nubra Valley by the Snow and Avalanche Studies Establishment (SASE) has indicated that by using a wind-diesel hybrid generating system, the annual consumption of diesel can be reduced by about 25%. There are many locations and border outposts in Ladakh and Kargil sectors where there is no power grid available and electricity is obtained through diesel generators. The field observatory where the study was carried out had an annual diesel consumption of 1.42 lakh liters for three generators having a combined capacity of 326 KW. The daily requirement in winters was 110 KW to cater to about 25 persons, with the major load being that of heating. “Using diesel generators is very expensive, given the ever rising cost of oil and transportation. Supplies and storage is also a major issue, especially during winter months and the adverse environmental impact of burning fossil fuel also has to be considered,” Ashwagosha Ganju, SASE Director said. “The DRDO is undertaking major programme to tap renewable energy sources,” he said. Wind speed in cold desert areas and along barren slopes is quite high during specific hours of the day. Statistical data collected by SASE showed the available wind energy resource in the region is high and wind energy can easily be exploited for providing cheaper and emission-free power. SASE’s studies have indicated that the cost of one KW electricity produced through the wind-diesel generator hybrid consisting of ten 10KW wind turbines and a 82KVA generator would be 0.16 dollars as compared to 0.25 dollars for convectional power generation when the price of diesel is taken an done dollar per litre. Pakistani fighter jets attacked suspected militant hideouts in tribal areas on the Afghan border on Sunday, killing at least 38 insurgents, officials said, in the third air strike in recent days. The raids came after peace negotiations with Taliban insurgents broke down last week and Prime Minister Nawaz Sharif authorised the Army on February 20 to attack militants in the volatile region on the Afghan border. "Fighter jets pounded training facilities of the terrorists in Tirah valley in Khyber Agency early on Sunday," said a military official. He said the facilities destroyed had been used to train suicide bombers and make explosives. 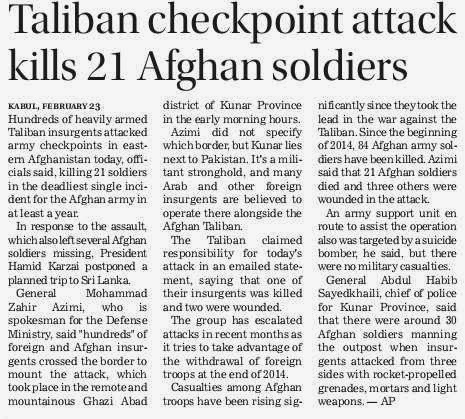 "There are confirmed reports that 38 terrorists, including some important commanders, were killed," said another security official, adding that at least six hideouts were destroyed. There were no immediate reports of civilian casualties. Despite the violence, both sides insist they are still open for negotiations. Many observers are sceptical about peace talks with a group which has killed 40,000 people since 2007. The Sunni Islamist Taliban told the government last week there was no chance of peace in the country unless Pakistan changed its political and legal system and officially embraced Islamic law. This year has been marked by a surge in violence and Sharif is under intense pressure from hawks in the armed forces to mount a tougher military response against the militants. 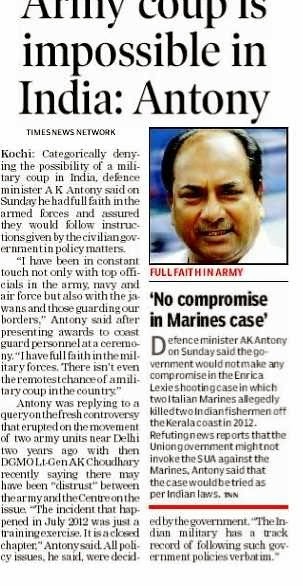 Kochi: Seeking to put a lid on fresh controversy over movement of two army units near Delhi in 2012, Defence Minister, A K Antony, on Sunday said Indian military is a responsible force which obeys the civilian government's decisions and in no circumstances there will be a military coup in the country. "In no circumstances there will be a military coup in India. Since the last seven years I have been associated with the Indian defence forces- those in the Army, Navy, Air Force and Coast Guard with not only with those on top but the ordinary jawans and personnel on the border region also,” said Antony. "I can say one thing with conviction. 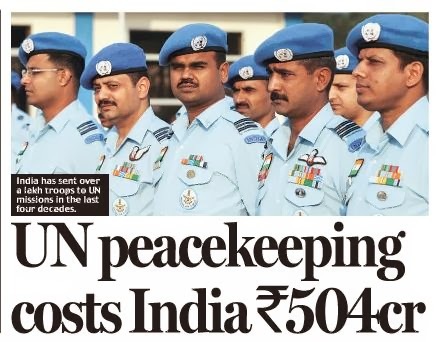 Indian military is a responsible force. While the military takes decisions on operations, it obeys all policy matters taken by the civilian government. There is no need for any concern," Antony told reporters on the sidelines of a Coast Guard Investiture ceremony on Sunday. The so called movement of army was a "routine training exercise" only. It is a 'closed chapter", he said. He was replying to a query on the fresh controversy that erupted on the movement of two army units near Delhi two years ago with the then DGMO Lt Gen A K Choudhary, stating that there may have been ‘distrust’ between the Army and government on the issue. "There is no need for any worry. There is no possibility of a military coup. I have full faith in the military and there is no remote possibility of a coup," he added. The revelation was "not new". In 2012, Antony said, he had given replies to Parliament three times-- twice for starred questions and once on an unstarred query, he said adding it was there in Parliament records. 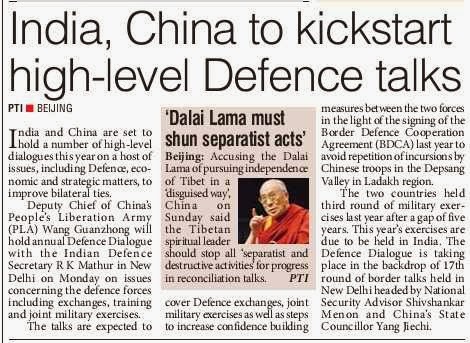 India and China are set to hold a number of high-level dialogues this year on a host of issues, including defence, economic and strategic matters, to improve bilateral ties. Deputy Chief of China's People's Liberation Army (PLA) Wang Guanzhong will hold annual Defence Dialogue with the Indian Defence Secretary R K Mathur in New Delhi tomorrow on issues concerning the defence forces including exchanges, training and joint military exercises. The talks are expected to cover defence exchanges, joint military exercises as well as steps to increase confidence building measures between the two forces in the light of the signing of the Border Defence Cooperation Agreement (BDCA) last year to avoid repetition of incursions by Chinese troops in the Depsang Valley in Ladakh region. The two countries held third round of military exercises last year after a gap of five years. This year's exercises are due to be held in India. The Defence Dialogue is taking place in the backdrop of 17th round of border talks held in New Delhi headed by National Security Advisor Shivshankar Menon and China's State Councillor Yang Jiechi. The two countries would also hold the annual Strategic Economic Dialogue (SED) here on March 18-19. Deputy Chief of the Planning Commission Montek Singh Ahluwalia would head the Indian delegation at the talks, officials here told PTI. The SED which discuses economic and trade relations between the two countries would cover issues like enhancing cooperation in important sectors such as infrastructure and high-technology, handling of the present global economic situation, cooperation in international monetary and financial systems, global commodity markets, sustainable development and climate change. The two countries are also finalising dates for the annual Strategic Dialogue, an informal talks mechanism that covered a vast areas of mutual interest to be held between top officials of the foreign ministries of both the countries. In an interesting development, the next round of Indo-US joint Army exercises — that were to take place in April this year — has been postponed by a few months. The exercises were to take place at Chaubatia in Uttarakhand in April this year but has now been postponed to July or August this year, defence sources have confirmed. Defence sources said that mutual convenience of the two sides is the major factor in the re-scheduling of the exercises and that nothing more should be read into it. But the fact remains that ties between the two countries have nose-dived since the Winter of 2013 following the earlier arrest of Indian lady-diplomat Devyani Khobragade in the United States. 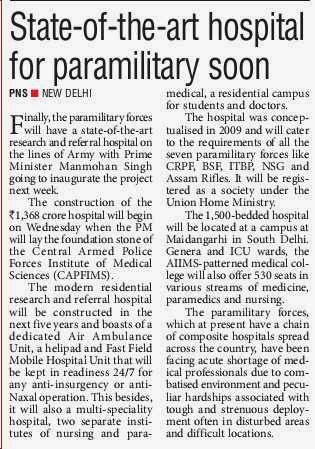 Significantly, the exercises will now be held at a time when the next government will be in place in India at the Centre. The US has already begun the exercise of reaching out to major Indian Opposition leaders whom it perceives could be important figures in the formation of the next government in May this year. It is unclear whether the current frost in ties between the two countries had any role to play in the postponement of the joint exercise. The Indian Army had conducted joint exercises in 2013 with the United States Military at Fort Bragg in the US in May, 2013. Joint military exercises between the two countries are an annual feature. India has conducted a large number of bilateral exercises with the US in the past few years involving the armies, air forces and navies of the two countries. Despite the recent irritants in ties, the US has strengthened strategic ties between the two countries.